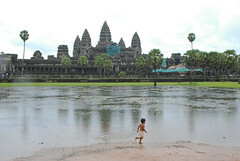 The government earned $85.57 million in revenue from the sale of tickets at Angkor Wat for this year’s first nine months, a hike of nearly 13 percent compared to last year, according to the figures from Angkor Enterprise. From January to September, more than 1.9 million visitors visited the Angkor archeological park, an increase of about 8.5 percent compared to the same period last year, the figures released yesterday said. However, in September alone, there were about 156,865 visitors or an increase of 8.3 percent compared to the same period last year. Multiple news reports write that tourist revenue for the Angkor temples is up significantly, due in no small part to the revised ticket pricing put into effect earlier this year. Revenue from ticket sales to foreigners visiting Cambodia’s Angkor archeological park rose to 45.9 million U.S. dollars in the first five months of 2017, up 64 percent compared to the same period last year, according to an official report released on Thursday. The ancient park welcomed 1.09 million international tourists during the January-May period this year, up 12 percent over the same period last year, said the report of the state-owned Angkor Enterprise. TTR Weekley, 05 May 2017: Revenues jump due largely to hike in admission fee, but numbers of tourists visiting Angkor are also up. Ticket sales revenue earned from foreigners visiting Angkor Wat’s archaeological park reached USD39.25 million during January to April, this year, up 60.21% compared with the same period last year. The surge in revenue was attributed mainly to a 1 February increase in entrance fees, although the head count at the gate has also increases substantially. I suspect this story is more about local politics than archaeology: the Angkor Archaeological park generates millions of dollars in ticket sales revenue for Cambodia, but local lawmakers are disputing the figures. The Apsara Authority reports a rise in tourist revenues for entry into the Angkor Archaeological Park year-on-year to the end of October. Cambodian officials have denied that holes were drilled into the walls of Angkor Wat for the installation of light fixtures, which will allow visitors into Angkor until 8.30 at night. The lights are also said to be solar powered, rather than tapping onto the existing electricity grid. Can any recent visitors to Angkor confirm this? It’d be interesting to see how the light setup looks like, and how the atmosphere of the ancient temples change at night. This recent push to extend Angkor’s opening hours comes at a time when visitor revenues have dropped 20% in the first quarter of the year. The Apsara Authority blames the political instability in Thailand for the drop in revenue, but I also suspect that it’s the global downturn that’s having a significant role in the depressed tourism numbers.